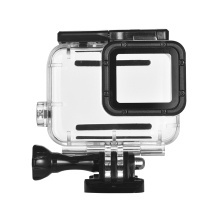 Ideal for diving, snorkeling, surfing, wakeboarding and other water sport activities, you can film beautiful underwater world freely. 45m waterproof, safe and can meet the needs of most underwater activities. No need to remove lens, more convenient and no affect to the shooting effect. Applicable to GoPro hero 6/5.